The transcriptional heterogeneity within human adipose-derived stromal cells can be defined on the single cell level using cell surface markers and osteogenic genes. We describe a protocol utilizing flow cytometry for the isolation of cell subpopulations with increased osteogenic potential, which may be used to enhance craniofacial skeletal reconstruction. Bone marrow-derived mesenchymal stromal cells (BM-MSCs) are considered the gold standard for stem cell-based tissue engineering applications. However, the process by which they must be harvested can be associated with significant donor site morbidity. In contrast, adipose-derived stromal cells (ASCs) are more readily abundant and more easily harvested, making them an appealing alternative to BM-MSCs. Like BM-MSCs, ASCs can differentiate into osteogenic lineage cells and can be used in tissue engineering applications, such as seeding onto scaffolds for use in craniofacial skeletal defects. ASCs are obtained from the stromal vascular fraction (SVF) of digested adipose tissue, which is a heterogeneous mixture of ASCs, vascular endothelial and mural cells, smooth muscle cells, pericytes, fibroblasts, and circulating cells. Flow cytometric analysis has shown that the surface marker profile for ASCs is similar to that for BM-MSCs. Despite several published reports establishing markers for the ASC phenotype, there is still a lack of consensus over profiles identifying osteoprogenitor cells in this heterogeneous population. This protocol describes how to isolate and use a subpopulation of ASCs with enhanced osteogenic capacity to repair critical-sized calvarial defects. In a previous study using single cell transcriptional profiling of 48 genes, considerable transcriptional heterogeneity was observed among ASCs.6 However, the distribution of genes MSX2, BMP-5, BMP-7, ALP, OCN, RUNX2 exhibited a strong association with a cluster of cells possessing highly osteogenic transcriptional profiles. To isolate cells according to this osteogenic gene expression profile, surface antigen expression patterns were correlated with transcription patterns and surface marker expression of endoglin (CD105) was subsequently discovered to closely correlate with enhanced osteogenic differentiation potential of ASCs. Independent of CD105 expression, expression of surface receptor Thy-1 (CD90), a glycosyl-phosphatidylinositol-linked membrane protein previously shown by Chen et al. to be associated with osteoprogenitor cells, was also correlated with osteogenic gene expression.6,7 These findings provide the opportunity to prospectively isolate subpopulations within the larger heterogeneous pool of ASCs with increased osteogenic capacity for cell-based bone tissue engineering applications. NOTE: All patient samples were obtained with informed consent, and experimental protocols were reviewed and approved by Stanford University Institutional Review Board (Protocol #2188 and #9999). Obtain human subcutaneous adipose tissue from healthy female patients undergoing elective lipoaspiration of the abdomen, flank, and/or thigh region under local/general anesthesia. Ensure that Institutional Review Board (IRB) approval has been obtained for the protocol of isolating ASCs from human tissues, and follow institutional safety precautions while working with such materials. To obtain the SVF from the lipoaspirated adipose tissue, first wash the lipoaspirate three times with equal volumes of 1x sterile phosphate-buffered saline (PBS). Carefully aspirate and discard the bottom aqueous layer. Prepare the collagenase digestion buffer: 0.075% Type I collagenase in Hank’s Balanced Salt Solution (HBSS). Prepare FACS buffer: 2% FBS, 1% P188 and 1% Pen-Strep in PBS. Filter both solutions using a commercially available 0.22 μm pore size fast flow polyethersulfone filter. To digest the washed adipose tissue, add an equal volume of collagenase digestion buffer and place digestion vessel securely in a shaking water bath for 60 min at 37 °C (approximately 180 shakes/min). NOTE: It is best to use a larger volume digestion vessel than required, as this allows for maximal digestion during shaking (i.e., 250 ml of collagenase digestion buffer, 250 ml of washed adipose tissue in a 1L sterile flask). Neutralize enzymatic activity by adding an equal volume of FACS buffer and allowing to sit at RT for 5 min. Next, centrifuge at 233 x g for 20 min at 4 °C. Carefully aspirate and discard the supernatant, taking care not to disturb the high-density SVF pellet. Resuspend the pellet in 5-10 ml of RT red cell lysis buffer, based on pellet size. Leave solution to sit at RT for 5 min and centrifuge at 233 x g for 5 min at RT. Aspirate supernatant and resuspend the pellet by adding 5-10 ml of traditional growth media, based on pellet size (Dulbecco's Modified Eagle Medium [DMEM]/10% FBS/1% penicillin-streptomycin solution [pen-strep]). Filter the suspension through a 100 μm nylon cell strainer to remove cellular debris. Centrifuge at 233 x g for 5 min at 4 °C, and discard the supernatant without disrupting the pellet. Resuspend the pellet in 5-10 ml of traditional growth media, based on pellet size. Place 2 x 106 cells in a 15 cm standard culture dish and establish primary cultures O/N at 37 °C/21% O2, 5% CO2. Maintain at sub-confluent levels to prevent spontaneous differentiation at 37 °C/21% O2, 5% CO2 in growth media. NOTE: Cell density in a fully confluent 15 cm plate is approximately 4-6 x 106 cells. Culture ASCs in traditional growth medium at 37 °C/21% O2, 5% CO2, for 36 hr before staining/sorting. Lift ASCs from culture plates using Accutase (as per manufacturer’s protocol). Wash cells once with FACS buffer (PBS with 2% FBS and 1% pen-strep). Centrifuge at 233 x g for 5 min at 4 °C. Discard the supernatant without disrupting the pellet. Resuspend the cells in 0.5-1 ml of FACS buffer (depending on cell number and amount of antibody desired). NOTE: The volume of the cell suspension, in accordance with the FACS antibody manufacturer’s recommendations, determines antibody concentration. However, titration of antibody concentration, using a starting concentration of 1:100, is usually advised if it is the first time to use an antibody. Count the total number of cells using a hemocytometer. Reserve 100 ul aliquots in 1.5 ml centrifuge tubes to be used for an unstained sample and single-color controls (according to the number of fluorescent antibodies used). Add the appropriate fluorescently-labeled monoclonal antibodies (at predetermined concentrations, per manufacturer’s instructions) and incubate for 20-30 min on ice, shielded from light. To label osteogenic subpopulation: Dilute anti-CD90 (APC anti-human CD90 (Thy1)) or anti-CD105 (FITC anti-human CD105 (endoglin)) in FACS buffer to a concentration of 1:50. To label other cell populations (e.g., hematopoietic and endothelial cells): Dilute anti-CD45 (Anti-Human CD45 Pacific Blue), anti-CD34 (Anti-Human CD34 APC), and/or anti-CD31 (Anti-Human CD31 PE) in FACS buffer to a concentration of 1:50. If not using directly conjugated antibodies, use a biotinylated primary antibody with an appropriate streptavidin-conjugated secondary antibody, such as Streptavidin PE-Cy7, at a dilution of 1:100. After incubation, wash the cells twice: fill tubes with FACS buffer and centrifuge at 233 x g for 5 min at 4 °C, aspirating supernatant. Resuspend the cells in 400-500 μl FACS buffer and filter samples through a 70 μm nylon cell strainer to remove cell clumps. Transfer labeled cells into FACS tubes with filter top and keep samples on ice for the duration of analysis. NOTE: The following steps mandate previous knowledge in fluorescence-activated cell sorting (FACS) or the assistance of a skilled technician. Using the appropriate FACS software, design analysis plots to examine forward scatter (FSC), side scatter (SSC), Phycoerythrin (PE)-Texas Red, Pacific Blue, Fluorescein Isothiocyanate (FITC), Allophycocyanin (APC) and any other fluorophore used to label cells. Prior to loading into the cell sorter, briefly vortex each sample to resuspend the cells. Commence with analysis of the unstained sample in order to set gates for the total cell population, to exclude cellular debris, and to determine baseline autofluorescence. Add propidium iodide (PI) to the unstained sample and analyze it in order to visualize the population of live cells within the total cell population. Construct a gate around this population. Analyze a single-color control sample for each fluorochrome in order to set fluorescence compensation. Analyze the stained sample to set the position of gates for sorting. Add PI to the stained sample in order to stain dead cells. Sort the labeled cell populations. Sort into either 1.5 ml centrifuge tubes or conical tubes (15 ml) containing culture medium. Manually cease sorting once the required quantity of cells has been obtained. Using FACS, perform a purity check by analyzing a small fraction (e.g., 500 cells) of the acquired cell population. NOTE: This step confirms the purity of the sorted cell populations. Ideally, purity should be greater than 90-95%. Centrifuge cells at 233 x g for 5 min at 4 °C immediately following completion of sorting and resuspend in 1 ml of fresh medium containing 10% FBS. NOTE: The amount of media used may be increased based on the size of the cell pellet. Plate on gelatin-coated plates to improve cell viability. Depending on final cell yield, plate 300,000 cells per well in a 6-well plate, 100,000 cells per well in a 12-well plate. Using CD90 as a marker for cells with enhanced osteogenesis results in isolation of a highly-enriched populations of human ASCs (Figure 1A, 1B). ASCs were stained with Pacific Blue-conjugated anti-human CD45, FITC-conjugated anti-human CD105, and APC-conjugated anti-human CD90. After sorting, the level of purity was greater than 98%, as quantified by post-sort analysis. Defining groups of cells based on transcriptional profiles allowed for prospective isolation of two novel subpopulations. To characterize the osteogenic potential of each promising subpopulation (CD90+ and CD105low), as well as that of the unsorted population in vitro, cells were cultured in osteogenic differentiation medium for 14 days, as previously described 6,8,9. Alkaline phosphatase staining (used for early detection of bone formation10) at Day 7 was significantly increased in the CD90+ population relative to other groups (Figure 2A). This was observed both grossly and after quantification (Figure 2A). 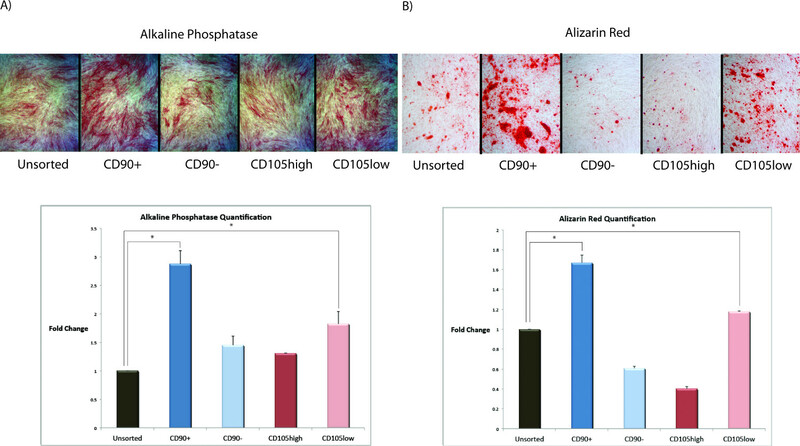 Similarly, Alizarin Red staining (an assay used to detect extracellular matrix mineralization and a metric for end-terminal osteogenic differentiation9) at Day 14 showed that CD90+ ASCs were able to mineralize a significantly greater amount of extracellular matrix (Figure 2B). Isolated ASCs retain the ability to undergo osteogenic differentiation after sorting but may require a few days to recover. It is essential to perform all further experiments with low passage cells, as ASCs become senescent during propagation in culture. Figure 1: (A) Gates for cell size and complexity were drawn to exclude cell debris and isolate a population of single cells for further analysis. (B) FACS analysis of single-sorted CD90 (left) and single-sorted CD105 (right) ASCs 36 hr after ASC harvest. Please click here to view a larger version of this figure. Figure 2: (A) Alkaline phosphatase staining (top) and quantification (bottom) of ASCs after 7 days of culture in osteogenic differentiation medium. (B) Alizarin red staining (top) and quantification of staining (bottom) of ASCs after 14 days of culture in osteogenic differentiation medium. 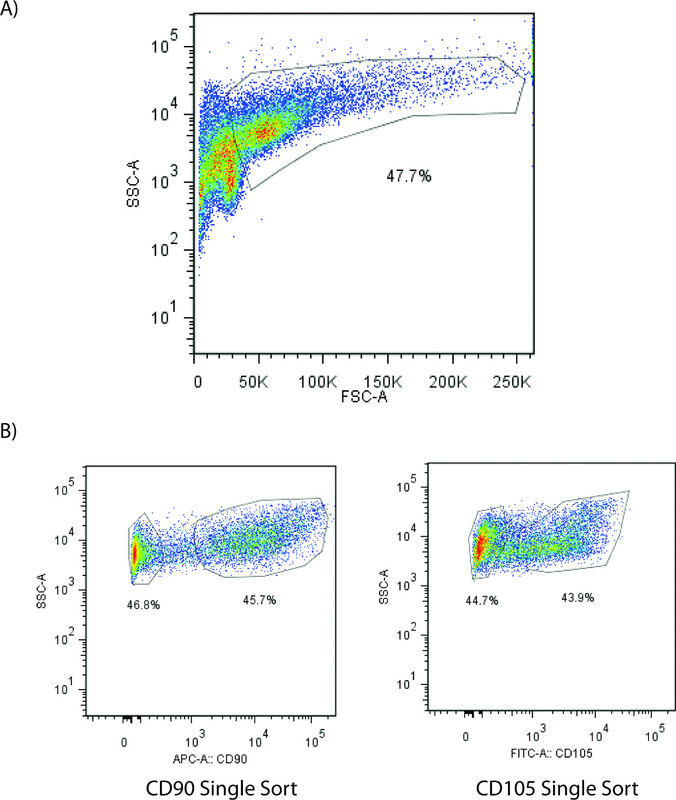 CD90+ ASCs and CD105low cells show increased alkaline phosphatase staining and extracellular matrix mineralization compared to unsorted cells (*p <0.05; two-tailed student’s t-test). Please click here to view a larger version of this figure. Currently, the isolation of homogenous subpopulations of ASCs from the SVF of human adipose tissue remains a challenging though desirable goal. Isolation of pro-osteogenic ASC subpopulations is particularly desirable, as such cells can be used to study the formation and homeostasis of skeletal tissues. However, the SVF of adipose tissue harbors significant heterogeneity with regard to stem cell capacity and differentiation potential.11 The molecular basis for this heterogeneity cannot be understood from pooled populations of cells, and instead requires single cell analysis.12 With this approach, surface markers closely associated with the osteogenic differentiation capacity of ASCs can be identified. The most critical factor for successful enrichment of ASCs, as described in the above method, is related to the antibodies utilized for FACS. One must be prudent to select an antibody with a high affinity for the cell-surface marker in question. Ideally, it should be a primary conjugated antibody as opposed to an indirect staining method, which requires multiple steps and thus, increased chance of cell death, cell loss and error accrual. Furthermore, minor modifications during FACS can increase cell viability. These include sorting into a cool receptacle, keeping cells on ice at all times, sorting cells into receptacles which contain culture media and also, plating the acquired cell populations on culture plates which have been pre-coated with 10% gelatin. It is important to perform a post-sort purity analysis, in order to ensure the purity of the sorted cells. This technique is limited by the availability of FACS equipment and expertise within a facility. Furthermore, as the primary samples are heterogeneous, the expression of surface markers will change on an individual basis. As aforementioned, it is essential to perform all experiments with low passage cells, as ASCs become senescent during propagation in culture. In addition, it is known that ASCs exhibit a shift in phenotypic expression under in vitro conditions which may alter the stem cell biology. Thus, for clinical translation, it would be optimal to obtain a highly purified cell population for direct transplantation or cell seeding to a scaffold without the need for in vitro cultivation. In addition, the large volumes of lipoaspirate which need to be processed to isolate the SVF can be burdensome to those unfamiliar with the technique, as discussed and addressed by Zuk and colleagues in a recent publication13. As per the method described by Zuk et al., this protocol can easily be scaled up or down to accommodate the volume of lipoaspirate and can be adapted to isolate ASCs from fat tissue obtained through abdominoplasties and other similar procedures. CD90 and CD105 have previously been identified as early mesenchymal stem cell markers, both in BM-MSC and ASC populations. In keeping with previous research, the CD90+ population represented approximately 50% of the freshly isolated SVF.14 In contrast, only about 5-10% of the initial SVF expressed CD105.6 Notably, with successive passages, CD105 expression rapidly increased from almost zero to nearly ubiquitous expression after 4-7 days in culture. It is known that ASCs exhibit considerable phenotypic drift during in vitro expansion, which may alter the biology of stem cells.15-17 Ideally, clinical applications for stem cells would involve the immediate use of purified cell populations for direct transplantation or seeding upon a scaffold, without the need for in vitro cultivation. The percentage of CD90+ cells may vary between different lipoaspirate samples in a fat depot-dependent origin or age-dependent manner. Nevertheless, using CD90 as a cell surface marker allows for enrichment of a subpopulation of human ASCs with enhanced osteogenic potential. This method of osteogenic enrichment has the potential to serve as a novel means for promoting rapid and robust bone formation in patients with critical-sized skeletal defects. We routinely observe that approximate cell yield from standard lipoaspirate is 5 x 107 nucleated cells/500 ml of lipoaspirate using the aforementioned harvest method, although as described above this can vary based on fat depot origin or patient demographics.18 Yoshimura and colleagues reported that ASCs represent 10-35% of the population of nucleated cells in the SVF.19 Therefore, there is considerable potential for direct seeding of a scaffold for implementation of bone tissue engineering strategies following osteogenic enrichment of ASCs using FACS. Stem cell-based tissue engineering for experimental and clinical applications often requires highly purified cell populations. Other high-throughput methods of purification exist as simpler alternatives to FACS, include panning, complement depletion, and magnetic-activated cell sorting (MACS). However, in certain situations, FACS is both necessary and advantageous: when the isolation of highly pure subpopulations is desired, when the target surface marker occurs infrequently in the cell population, or when cells must be separated based on varying expression levels of the same surface marker. Together, these data illustrate the effectiveness of sorting ASCs based on specific cell surface markers that correlate with osteogenic transcriptional activity. Although the feasibility of this approach is demonstrated here through the use of CD90 and CD105 as examples, further analysis needs to be done to include all promising combinations of surface antigen expression that highly correlate with osteogenic transcriptional activity. None of the authors have a financial interest in any of the products, devices, or drugs mentioned in this manuscript. None of the authors have any competing financial interest to report. This study was supported by National Institutes of Health Research grant R01-DE021683-01 and National Institutes of Health Research grant R01-DE019434 to M.T.L. ; Howard Hughes Medical Institute Research Fellowship to M.T.C. D.C.W was supported by the A.C.S Franklin Martin Faculty Research Fellowship, The Hagey Laboratory for Pediatric Regenerative Medicine, and the Stanford University Child Health Research Institute Faculty Scholar Award.